1. Department of Nuclear Medicine, Peking Union Medical College (PUMC) Hospital, Chinese Academy of Medical Science and PUMC, Beijing 100730, China. 2. Beijing Key Laboratory of Molecular Targeted Diagnosis and Therapy in Nuclear Medicine, Peking Union Medical College (PUMC) Hospital, Chinese Academy of Medical Science and PUMC, Beijing 100730, China. 3. Division of Medical Oncology, Peking Union Medical College (PUMC) Hospital, Chinese Academy of Medical Science and PUMC, Beijing 100730, China. 4. Key Laboratory of Endocrinology of National Health and Family Planning Commission, Peking Union Medical College (PUMC) Hospital, Chinese Academy of Medical Science and PUMC, Beijing 100730, China. 5. Laboratory of Molecular Imaging and Nanomedicine, National Institute of Biomedical Imaging and Bioengineering (NIBIB), National Institutes of Health (NIH), Bethesda, MD 20892 USA. Objective: 177Lu-DOTA-EB-TATE is a theranostic agent based on octreotate that uses an Evans blue structure to bind albumin to improve the pharmacokinetics and pharmacodynamics. This pilot study aims to evaluate the efficacy of a single low-dose treatment using 177Lu-DOTA-EB-TATE in patients with advanced neuroendocrine neoplasm (NEN). Methods: With IRB approval and informed consent, 4 NEN patients were enrolled to undergo 177Lu-DOTA-EB-TATE treatment with a single low dose of 0.66 ± 0.06 GBq (17.8 ± 1.7 mCi); 3 other NEN patients were enrolled as controls to undergo 177Lu-DOTA-TATE treatment with administered activity of 3.98 ± 0.17 GBq (107.6 ± 4.6 mCi). 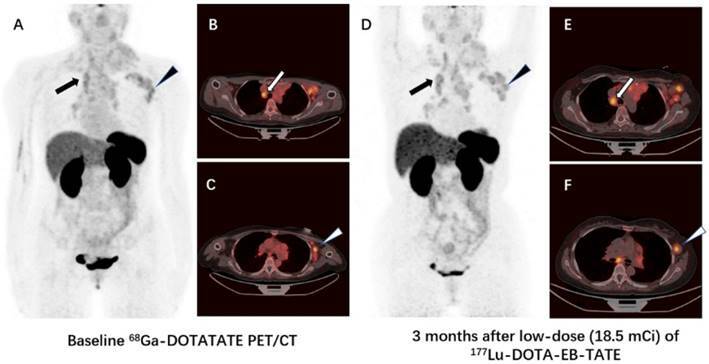 One primary tumor and 62 metastatic lesions in the 7 patients were evaluated by 68Ga-DOTA-TATE PET/CT immediately before and one or three months after the treatment. Maximum SUV (SUVmax) of the tumors ≥2.0 cm in diameter were measured and percentage of change (ΔSUV) after treatment were calculated. Results: All 4 patients subjected to 177Lu-DOTA-EB-TATE treatment tolerated the administered activity without significant adverse effects and showed symptomatic remission. Among the patients, 40 tumors were found with diameter ≥2.0 cm, with the baseline SUVmax varied from 1.5-82.9 (35.9 ± 21.0) and the ΔSUVs before and three months after the treatment from -75.1-26.3% (-38.9 ± 25.5%). Twenty-nine (72.5%) of the tumors showed >15% decrease of SUVmax (ΔSUV = -75.1%--17.1%). There was a significant negative correlation between the baseline SUVmax and the ΔSUV after treatment (r = -0.852, P < 0.001). Compared with the control 177Lu-DOTA-TATE therapy, the 177Lu-DOTA-EB-TATE treatment using approximately 1/6 the dose showed no significant difference in ΔSUV (-7.9 ± 5.4% vs. -5.8 ± 3.9%, P = 0.189) as demonstrated by the tumors with comparable baseline SUVmax from 10.0-35.0. Conclusion: A single low-dose 177Lu-DOTA-EB-TATE treatment appears to be safe and effective in the treatment of NENs with high 68Ga-DOTA-TATE uptake. This pilot study merits further investigation with increased dose and frequency of 177Lu-DOTA-EB-TATE administration with potential advantages over 177Lu-DOTA-TATE. Neuroendocrine neoplasms (NENs) are tumors arising from diffuse neuroendocrine system cells. They are classified as G1 to G3 according to grading based on the percentage of Ki67-positive cells [1, 2]. NENs are characterized by high expression of somatostatin receptors (SSTRs), which allows radiolabeled somatostatin analogs for receptor mediated imaging and internal radiotherapy. NENs most frequently occur in the digestive tract (66%), followed by the respiratory tract (31%) . Currently, the treatment options for NENs include surgery, interventional radiology, and medical treatments such as somatostatin analogs, interferon, chemotherapy, new targeted drugs and peptide receptor radionuclide therapy (PRRT) [4-6]. PRRT is an effective option of therapy for patients with well-differentiated unresectable or metastatic NENs. Lutetium-177 (177Lu) is a beta- and gamma-emitting radionuclide with a maximum particle range of 2 mm and a half-life of 160 hours . The chelated analog [DOTA0,Tyr3]-octreotate (DOTA-TATE) can be labeled with 177Lu and has been used in the clinic . In recent years, many studies have reported that PRRT with 177Lu-DOTA-TATE is effective in reducing specific symptoms of the neuroendocrine syndrome or pain caused by bone metastases and seldom toxic in progressive NENs [9-13]. TATE clears from the blood through the kidneys, which is the critical dose-limiting organ for PRRT [12, 14]. In order to maximize the efficacy and minimize the toxicity, a recent paper by Tian et al. 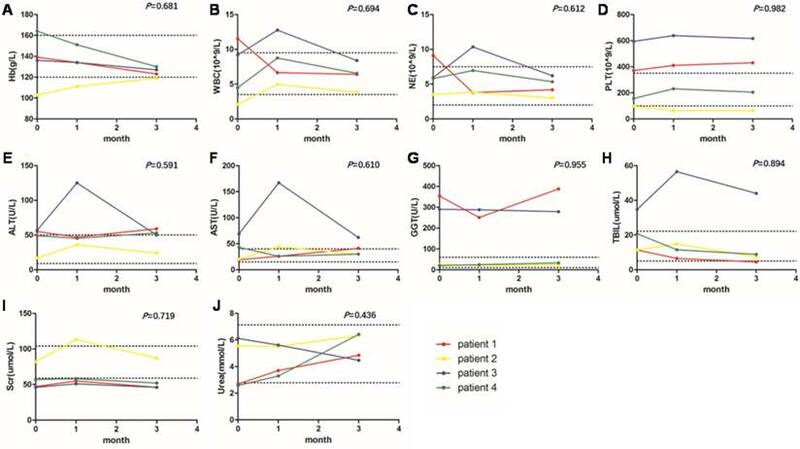 reported that Evans blue (EB) modification of octreotate that uses endogenous albumin as a reversible carrier effectively extends the half-life in the blood and substantially increases targeted accumulation and retention of 86Y/90Y-DOTA-EB-TATE in the tumors, leading to highly effective eradication of SSTR2 positive tumors in multiple xenograft models . The encouraging preclinical data prompted us to test radionuclide-labeled DOTA-EB-TATE in NEN patients. The first-in-human study showed remarkably higher tumor uptake and retention of 177Lu-DOTA-EB-TATE over 177Lu-DOTA TATE . This study was to determine whether administration of imaging level low dose would have objective therapeutic response, providing rationale for future dose optimization studies to balance treatment response and side effects. After obtaining the approval from the Institutional Review Board of Peking Union Medical College Hospital and informed consent for participation, we enrolled 7 NEN patients (5 men, 2 women; age: 28-62 years) from August 2017 to December 2017. All patients had a histological confirmation of NEN before the treatment, including 2 patients with Grade 1 neuroendocrine tumors, 4 patients with Grade 2 neuroendocrine tumors, and 1 patient with Grade 3 neuroendocrine carcinoma. All the patients had an extended disease with multiple metastases, with the most common location being the liver (85%), followed by regional lymph nodes (71%) and bone (14%). All 7 patients received one cycle of radionuclide therapy, including 4 patients in the 177Lu-DOTA-EB-TATE group and 3 in the 177Lu-DOTA-TATE group (control group). Before the treatment, 3 patients had the primary tumors removed, 2 patients had splenectomy, and 1 patient had liver segmentectomy. One patient underwent 125I brachytherapy of the primary tumor in pancreas head 4 years ago. All 7 patients received somatostatin analogs therapy and chemotherapy 6 months before the recruitment (Table 1). Blood tests for hematology parameters, kidney and liver functions were evaluated before and 1 month, and 3 months after 177Lu-DOTA-EB-TATE treatment. The following inclusion criteria were defined: patients with histological confirmation of NEN tumor; inoperable or metastatic disease; assessment of the presence of somatostatin receptor imaging (SRI) with PET/CT using 68Ga-DOTA-TATE, SRI positive in all lesions with uptake in majority of them higher than the liver, evaluated within 1 week before inclusion; hemoglobin level (Hb) ≥10 g/dL, leucocytes (WBC) ≥3×109/L, thrombocytes (PLT) ≥90×109/L; calculated creatinine clearance (CrCl) >40 mL/min; life expectancy >3 months; no pregnancy or lactation; age >18 years. DOTA-TATE or DOTA-EB-TATE (100 µg dissolved in 20 μL of absolute ethyl alcohol) was added to 200 μL of 0.5 M NaOAc (pH 5.6) and then added 3700 MBq (100 mCi) 177LuCl3 obtained from LuMark®, IDB, Holland. The mixture was heated for 30 min at 100 °C and then purified by C18 cartridge and passed through a 0.22-µm aseptic filtration membrane. The quality control was performed with analytical thin-layer chromatography (Bioscan, USA). CH3OH:NH4OAc (v/v 1:1) was used as the developing solution. The radiolabeling yield was greater than 80% and the radiochemical purity of 177Lu-DOTA-TATE or 177Lu-DOTA-EB-TATE was more than 95%. The single low-dose 177Lu-DOTA-EB-TATE treatment was performed on an out-patient basis. The mean administered activity in 4 patients was 0.65 ± 0.06 GBq (17.8 ± 1.7 mCi). The dosage was chosen based on dosimetry evaluation using SPECT/CT. The 177Lu-DOTA- TATE treatment was performed in the ward. The mean administered activity in 3 patients was 3.98 ± 0.17 GBq (107.6 ± 4.6 mCi). Therapy administration was preceded by oral medication of an antiemetic (ondansetron 8 mg). 177Lu-DOTA-EB-TATE or 177Lu-DOTA-TATE diluted in 100 mL of physiological saline was administered slowly in an intravenous infusion for over 30 min. To inhibit tubular reabsorption of the radiopeptide, 1,000 mL of a solution of arginine (25 g/L) was co-infused, starting 30 min before the administration of radiopharmaceutical and lasted over 4 h. Care needs to be taken to prevent possible electrolyte imbalance (hyperkalaemia and hypernatraemia), that might lead to mild nausea and vomiting . Clinical response was assessed on the basis of symptom and by visual analog score (VAS) which was used for pain documentation . The intensity of pain on a scale ranged from 0 to 10, for which a 0 score implies no pain, score 6 implies moderate pain, and 10 implies intolerable pain. Pain relief was assessed based on comparison of pain at baseline and one or three months post therapy. On the basis of VAS scoring, response was divided into four categories: CR (>70% decrease in VAS), PR (40-70% decrease in VAS), minimal response (MR, 20-40% decrease in VAS), and no response (<20% decrease in VAS or increase in pain). Before and again at three months after the treatment of 177Lu-DOTA-EB-TATE, before and 1 month after the treatment of 177Lu-DOTA-TATE, these patients underwent whole-body PET acquisitions (Biograph mCT PET/CT system; Siemens) at 40 min after intravenous injection of 68Ga-DOTA-TATE in a dosage of approximately 1.85 MBq per kilogram body weight. Whole-body images were acquired using a low-dose CT scan (120-kV, 35 mA, 3-mm layer, 512×512 matrix, 70 cm FOV) from the pelvic bottom to the skull base. Immediately after the CT examination, whole-body PET was obtained with a 2-min acquisition per bed position using a three-dimensional acquisition mode. A scan usually included 5 or 6 bed positions according to the patient's height. All images were measured by the same physician who was masked to the clinical data with the same standard in the final analysis. A Siemens workstation (Multi-Modality Workplace) was used for post-processing. The regions of interest (ROI) of tumor lesions were drawn manually and the software automatically obtained the radioactivity concentration and SUV in the ROI. Background was determined as mean uptake in a 2.0 cm diameter circular ROI in the gluteus maximus, and tumor-to-muscle SUV ratio (T/M) was calculated accordingly. One primary tumor of pancreas head and 62 metastatic lesions with longest diameter ≥2.0 cm in 7 patients with NENs were evaluated by PET/CT, including 48 lesions of liver metastasis and 14 lesions of lymph-node metastasis. M: male; F: female; Syn: synaptophysin; CgA: chromogranin A. For molecular response evaluation, we chose up to five lesions with the highest 68Ga-DOTA-TATE uptakes in as many involved organ systems as possible as target lesions and calculated the change percentage (ΔSUV and ΔT/M) after treatment relative to baseline . Complete response (CR) was complete resolution of 68Ga-DOTA-TATE uptake in the target lesions. Partial response (PR) was defined as >15% decrease in the SUVmax of the target lesions from the baseline scan, and >15% increase in the SUVmax of the target lesions from the baseline scan was taken as progressive disease (PD). Neither CR, PR nor PD was considered stable disease (SD). Quantitative data were expressed as means ± standard deviations. Differences between two independent groups were determined by Student's t-tests. Differences among groups were compared with one-way analysis of variance. All statistical tests were 2-tailed, and a P-value of <0.05 was considered statistically significant. In addition, correlation analysis used the Spearman rank correlation test between the baseline SUVmax and ΔSUV. All statistical analyses were performed using SPSS 23.0 software (IBM SPSS, Chicago, IL, USA). The changes of indicators of hemotoxicity (A-D), hepatotoxicity (E-H) and nephrotoxicity (I, J) at baseline, 1 month and 3 months after the 177Lu-DOTA-EB-TATE treatment. The two dotted lines on each graph represent the upper and lower limits of the reference range. The P values were from one-way ANOVA of repeated-measures. No significant change was observed in hematology parameters, kidney and liver function. WBC, white blood counts; NE, neutrophils counts; PLT, platelet counts; Hb, hemoglobin; ALT, alanine aminotransferase; AST, aspartate transferase; GGT, glutamyl transpeptidase; TBIL, total bilirubin; Scr, serum creatinine. During the course of administration and follow-up, none of the patients developed remarkable side effects such as irritating pain, nausea, vomiting, allergy or fever due to the administration of 177Lu-DOTA-EB-TATE. At baseline, 1 month and 3 months after the 177Lu-DOTA-EB-TATE treatment, no significant change was observed in hemoglobin (P = 0.681), white blood count (P = 0.694), neutrophil count (P = 0.612) and platelet count (P = 0.982). In hepatotoxicity evaluation, no significant change was observed in alanine aminotransferase (P = 0.591), aspartate transferase (P = 0.610), glutamyl transpeptidase (P = 0.955), and total bilirubin (P = 0.894). Some indicators were abnormal at baseline in some patients due to the disease including liver metastasis, the downward trend after treatment indicated a recovery of diseases. In nephrotoxicity evaluation, no significant change was found in serum creatinine (P = 0.719) and urea (P = 0.436) (Fig. 1). All 4 patients with 177Lu-DOTA-EB-TATE treatment showed symptomatic remission in tumor-associated distension and pain. There was significant difference in the pre- and post-therapy mean VAS [pre-therapy: 5.7 ± 0.9, post-therapy: 2.5 ± 0.5 (P < 0.01)]. On the basis of VAS scoring, the symptom response was PR in all patients (Table 2). In a lesion-by-lesion analysis, one primary tumor of pancreas head and 39 metastatic lesions with longest diameter ≥2.0 cm were detected by 68Ga-DOTA-TATE PET/CT in 4 patients underwent 177Lu-DOTA-EB-TATE treatment. The baseline SUVmax varied from 1.5-82.9 (35.9 ± 21.0) and the ΔSUVs before and again three months after the treatment were -75.1-26.3% (-38.9 ± 25.5%). Twenty-nine (72.5%) of the tumors showed >15% decrease of SUVmax (ΔSUV=-17.1--75.1%) and two tumors had >15% increase of SUVmax (ΔSUV = 22.6% and 26.3%, respectively) in a patient with Grade 3 neuroendocrine cancer with SUVmax of 3.1 and 3.8, respectively (Fig. 2 A). There was a significant negative correlation between baseline SUVmax and ΔSUV after the treatment (r = -0.852, P < 0.001) (Fig. 2 C). Molecular response demonstrated by changes of 68Ga-DOTA-TATE uptake in the patients. A: Changes of tumor SUVmax in 40 NEN lesions with diameter ≥2.0 cm in 4 patients underwent a dose of 0.65 ± 0.06 GBq (17.8 ± 1.7 mCi) 177Lu-DOTA-EB-TATE treatment. B: Changes of tumor SUVmax in 23 NEN lesions in 3 control patients after 177Lu-DOTA-TATE treatment in a dose of 2.91 ± 0.12 GBq (107.6 ± 4.6 mCi). C: There was a significant negative correlation between baseline SUVmax and ΔSUV among the 40 NEN lesions underwent 177Lu-DOTA-EB-TATE treatment (r = -0.852, P < 0.001). The P value was from Spearman rank correlation test. D: In the tumors with comparable baseline SUVmax from 10.0-35.0, 177Lu-DOTA-EB-TATE treatment using approximately 1/6 the doses and 177Lu-DOTA-TATE therapy showed similar molecular response as revealed by ΔSUV (-7.9 ± 5.4% vs. -5.8 ± 3.9%, P = 0.189). The P value was from Student's t-test. 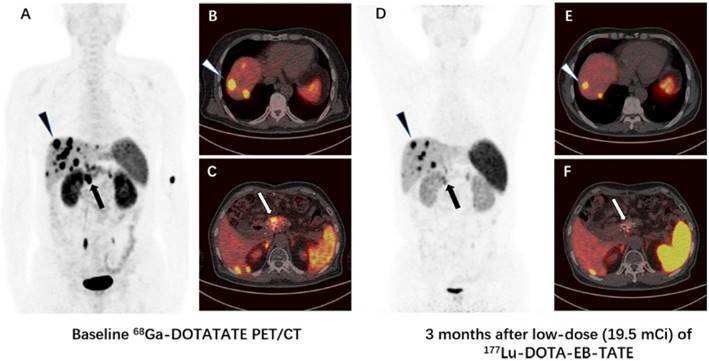 In 3 patients underwent 177Lu-DOTA-TATE treatment, 23 metastatic lesions with longest diameter ≥2.0 cm were detected by 68Ga-DOTA-TATE PET/CT. The baseline SUVmax varied from 8.2-34.6 (19.4 ± 8.6) and the ΔSUVs before and 1 month after the treatment were -42.2-47.6% (-23.3 ± 20.3%). Eighteen (78.3%) of the tumors showed >15% decrease of SUVmax (ΔSUV=-19.9--42.2%) and one tumors had >15% increase of SUVmax (ΔSUV = 47.6%) with SUVmax of 8.2 (Fig. 2 B). When the tumors with comparable baseline SUVmax from 10.0-35.0 were selected from the two groups for comparison, the 177Lu-DOTA-EB-TATE treatment using approximately 1/6 the doses showed no significant difference as compared to the control 177Lu-DOTA-TATE therapy as demonstrated by ΔSUV (-7.9 ± 5.4%, n = 16 vs. -5.8 ± 3.9%, n = 21; P = 0.189) (Fig. 2 D). A case-by-case analysis is demonstrated in table 2. In the 177Lu-DOTA-EB-TATE group, 3 patients with Grade 2 NENs showed decrease of summed target lesions SUVmax from 356.7, 175.3, and 88.5 to 123.8, 110.1, and 70.4, respectively (ΔSUV = -65.3%, -37.2%, and -20.4%) (Fig. 3). The other patient with Grade 3 NEN showed slight increase of summed SUVmax from 15.1 to 16.5 (ΔSUV = +9.2%) (Fig. 4). Referring to the criteria for response evaluation, 3 patients with high 68Ga-DOTA-TATE uptake showed partial response and the other patient with low uptake had stable disease. In the 177Lu-DOTA-TATE group, 2 patients showed decrease of summed target lesions SUVmax from 158.3 and 61.8 to 105.3 and 45.5, respectively (ΔSUV = -33.5% and -26.4%, respectively) (Fig. 5), and the other patient showed increase of summed SUVmax from 25.6 to 29.2 (ΔSUV = +14.0%). Referring to the criteria for response evaluation, 2 patients showed PR and the other patient had SD. The PRRT, developed over the last two decades, is based on the use of a receptor target and represents an accepted treatment option for patients with metastatic or inoperable SSTR-positive NENs. The somatostatin analog, labeled with a β-emitting radioisotope, binds specific membrane receptors that are generally overexpressed in NENs and their metastases, then the formed complex is internalized into the cell for the irradiation of the nucleus . Since the mid-2000s, octreotate (Tyr3, Thr8-octreotide), a newer analogue with improved affinity for SSTR2, has been synthesized. The impact of 177Lu-DOTA-TATE PRRT on PFS has been evaluated in numerous papers, with a general consensus reached on its good tolerability, especially for the kidneys, and on its high efficacy . As a first randomized clinical trial, the recent NETTER-1 phase III trial of 177Lu-DOTA-TATE vs. high-dose octreotide long-acting repeatable (LAR) in patients with midgut carcinoid tumors identified that 177Lu-DOTA-TATE resulted in markedly longer PFS than high-dose octreotide LAR and was associated with limited acute toxic effects . Lutetium (177Lu) oxodotreotide (Lutathera®) has been approved for the treatment of unresectable or metastatic, progressive, well differentiated (G1 and G2), somatostatin receptor positive gastroenteropancreatic neuroendocrine tumors (GEP-NETs) in adults by the European Commission and U.S. FDA. Comparison of 68Ga-DOTA-TATE PET/CT images immediately before (A-C) and 3 months after (D-F) a single low-dose (19.5 mCi) treatment of 177Lu-DOTA-EB-TATE in a patient (patient 2) with pancreatic neuroendocrine tumor and liver metastases. The SUVmax of the primary tumor in pancreas decreased from 26.7 to 13.0 (arrow), and the SUVmax of the highest-uptake liver metastasis decreased from 50.6 to 28.6 (triangle). The tumor-to-muscle uptake ratio changed from 29.0 and 55.0 to 13.7 and 30.1 for the primary tumor and liver metastasis, respectively. Comparison of 68Ga-DOTA-TATE PET/CT images immediately before (A-C) and 3 months after (D-F) a single low-dose (18.5 mCi) treatment of 177Lu-DOTA-EB-TATE in a patient (patient 4) with G3 neuroendocrine tumor originated from mediastinum (primary tumor removed). The SUVmax of the highest-uptake mediastinal lymph node metastasis increased from 4.0 to 4.2 (arrow), the SUVmax of the highest-uptake axillary lymph node metastasis increased from 3.8 to 4.8 (triangle). The tumor-to-muscle uptake ratio increased from 5.0 and 4.8 to 6.1 and 7.0 for mediastinal lymph node metastasis and axillary lymph node metastasis, respectively. Comparison of 68Ga-DOTA-TATE PET/CT images immediately before (A-C) and 1 month after (D-F) 105 mCi treatment of 177Lu-DOTA-TATE in a patient (patient 5) with G2 neuroendocrine tumor. The SUVmax of the highest-uptake liver metastasis decreased from 29.4 to 23.1 (arrow), the SUVmax of the highest-uptake abdominal lymph node metastasis decreased from 33.7 to 19.7 (triangle). The tumor-to-muscle uptake ratio decreased from 56.5 and 64.8 to 42.0 and 35.8 for liver metastasis and abdominal lymph node metastasis, respectively. Previous published clinical trials showed a good clinical response and an impact on the PFS and the OS in 177Lu-DOTA-TATE PRRT. Kwekkeboom et al. reported the first clinical results of 177Lu-DOTA-TATE (cumulative dose 22.2-29.6 GBq) in 34 GEP-NETs patients and showed that CR was found in 1 (3%) patient, PR in 12 (35%), SD in 14 (41%) and PD in 7 (21%) patients. Analysis of a large group of a total of 310 GEP-NETs patients was published in 2008 . Patients were treated with 177Lu-DOTA-TATE up to 27.8-29.6 GBq, usually in 4 treatment cycles. CR and PR occurred in five (2%) and 86 (28%) of 310 GEP-NETs patients, respectively. In a dose escalating study with 177Lu-DOTA-TATE, Bodei et al. treated 51 patients with SSTR2 positive tumors including 42 (82%) GEP-NETs patients. One patient (2%) had CR, 12 (29%) patients showed PR after the last administration of 177Lu-DOTA-TATE. Therefore, the CR and PR together in 177Lu-DOTA-TATE PRRT was limited to around 30%. In addition, despite kidney protection, loss of kidney function can occur after PRRT, with a creatinine clearance loss of about 3.8% per year for 177Lu-DOTA-TATE . Several other risk factors have also been identified for developing renal toxicity after PRRT: poor renal function, hypertension, and diabetes at baseline [24, 25]. To improve the pharmacokinetics of somatostatin analogs and reduce PRRT toxicity, Tian et al. reported the use of EB-TATE to chelate 86Y and 90Y, a diagnostic/therapeutic radionuclide pair and obtained improved contrast for imaging and highly effective radiotherapy of SSTR2-positive tumors in mouse xenografts models. Following the successful animal studies, a study was performed to compare the kinetics and dosimetry between 177Lu-DOTA-EB-TATE and 177Lu-DOTA-TATE in normal organs and tumors of NEN patients . The present work was to evaluate whether the imaging dose used for dosimetry study would already have some therapeutic effect. Anatomical responses based on the size of the tumor may lag weeks or months behind metabolic response , so we used the criteria based on 68Ga-DOTA-TATE uptake of tumors other than the morphologic criteria (RECIST) to evaluate the early therapeutic response to PRRT in NEN patients. One primary tumor of pancreas head and 39 metastatic lesions with longest diameter ≥2.0 cm in 4 patients were evaluated by PET/CT. Interestingly, all 4 patients were found to have remission in tumor-associated distension and pain, 3/4 patients showed PR and the other patient showed SD. In the control group (177Lu-DOTA-TATE) injected with approximately 6 times higher dose, 2/3 patients showed PR and the other patient had SD. There was virtually no significant difference in ΔSUV of tumors between the two groups of patients administered with low dose 177Lu-EB-DOTA-TATE and high dose 177Lu-DOTA-TATE (P = 0.189) when the tumors with comparable baseline SUVmax from 10.0-35.0 were selected for comparison (Fig. 2 D). Survival analyses of previous studies have shown that patients with high tumor SSTR expression at study entry had significantly higher objective responses and longer survival after being treated with either 177Lu-DOTA-TATE or 90Y-DOTA-TOC [9, 27]. 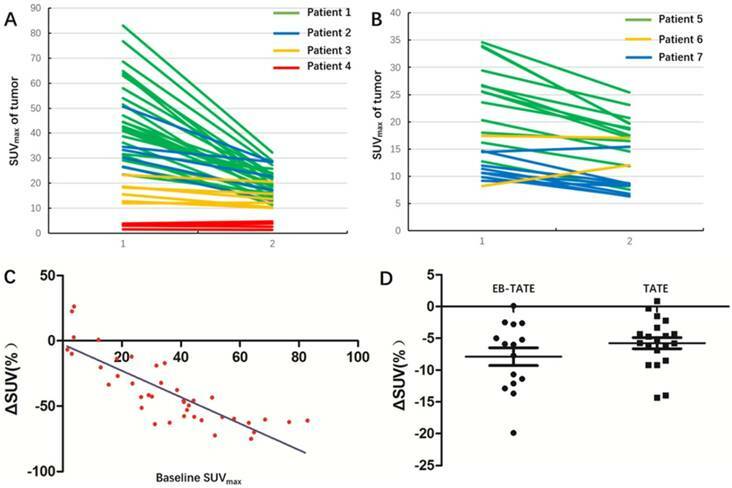 Our study demonstrated the similar trend of significant negative correlation between baseline SUVmax and ΔSUV (r = -0.852, P <0.001) in the 177Lu-DOTA-EB-TATE group, and a high baseline SUVmax may serve as a rough indicator for a high absorbed dose and, thus, better clinical response. The standard guideline recommendation for PRRT includes well-differentiated Grade 1 and Grade 2 NETs that express SSTR positivity, as evaluated by SRI with 68Ga-DOTA-TOC/TATE/NOC PET/CT or 99mTc-HYNIC-TOC scintigraphy or 111In-octreoscan. The recently published European Society for Medical Oncology Clinical Practice Guidelines (ESMO CPG) have recommended PRRT up to the upper limit of Ki-67 LI to 30% . Haug et al. applied SUVT/S (SUVmax of the tumor-to-spleen ratio) to evaluate the response to somatostatin receptor-mediated radionuclide therapy in patients with well-differentiated neuroendocrine tumors and proved ΔSUVT/S was superior to baseline SUVmax and ΔSUVmax for the prediction of treatment outcome. In our study, 2 Grade 1 NEN patients, 4 Grade 2 NEN patients and 1 Grade 3 NEN patient were recruited. Because 2 patients had splenectomy before the enrollment, we could not calculate the SUV of the tumors relative to the splenic uptake, thus background was determined as mean uptake in the gluteus maximus. PET/CT showed decrease of T/M in 3 Grade 2 NEN patients and increase of T/M in the Grade 3 NEN patient after 177Lu-DOTA-EB-TATE treatment; decrease of T/M in a Grade 1 NEN patient and a Grade 2 NEN patient and increase of T/M in a Grade 1 NEN patient after 177Lu-DOTA-TATE treatment. Our study was accompanied by certain limitations. Firstly, a limited patient size of this study will inevitably affect the strength of our conclusions. Secondly, our study had only a short mean follow-up duration of 3 months in 177Lu-DOTA-EB-TATE group and 1 month in 177Lu-DOTA-TATE group. However, this pilot study provides necessary data for the future design of a larger prospective study with escalating doses to determine the potential higher efficacy of 177Lu-DOTA-EB-TATE over 177Lu-DOTA-TATE for the therapy of NENs. Our study showed the efficacy of a single low dose of 177Lu-DOTA-EB-TATE in the treatment of NENs with high 68Ga-DOTA-TATE uptake, which merits further studies with escalating doses and frequencies of administration to determine the potential advantages of this long-acting formula over 177Lu-DOTA-TATE. This study was supported by the Key Project on Inter-Governmental International Scientific and Technological Innovation Cooperation in National Key Projects of Research and Development Plan (2016YFE0115400), the Intramural Research Program (IRP), National Institute of Biomedical Imaging and Bioengineering (NIBIB), National Institutes of Health (NIH). This study was also partly supported by the Chinese Academy of Medical Science Major Collaborative Innovation Project (2016-I2M-1-011), Welfare Research Funding for Public Health Professionals (201402001), National Nature Science Foundation (81741142, 81701742) and Beijing Municipal Natural Science Foundation (7161012).